The Marder III is a Rank II German tank destroyer with a battle rating of 2.7. It was introduced in Update 1.43. The armour of the Marder is its biggest fault. Because it is open-topped, strafing runs from fighter planes can disable the crew very easily, even leading to ammo detonation! Enemy tanks only have this privilege because of poor positioning of the Marder, or because of a highly exploited breakthrough of allied defences. The front turret armour is also very thin, and is vulnerable to basically any weapon save most 7.62 MGs. The hull armour at the front is rather thick at 50mm and is decently sloped for a tank destroyer. It still should not be relied on heavily, but if angled correctly it can be used to deflect British 2 pdr. guns, German, US and Russian 37mm and sometimes 50mm guns, as well as most ammunition used by the KV-1 series of tanks. The Marder also has surprisingly poor maneuverability for a small tank destroyer. 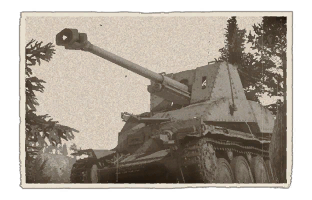 Being based on the Pz38(t) chassis, forward turning abilities slow the tank down significantly and neutral turning leaves a lot to be desired. 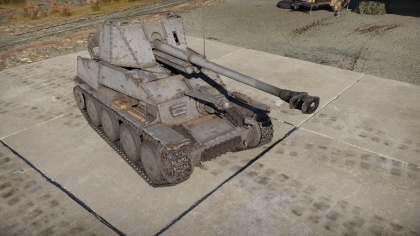 The fact that the Marder has a forward facing gun with no turret means that it is required for the whole vehicle to turn to align the gun onto target if out of its arc of fire. Therefore, it is highly recommended to play with a squadmate or more mobile player, as the mobility of the Marder can significantly hamper urban combat abilities. Use the high speed of the Marder to reach a comfortable shooting position and stay there- the poor traverse and turning speed is fatal against nearly all turreted vehicles, along with the very poor armour. However, the Marder makes up for most of these drawbacks with its high velocity, high damage 76mm cannon. It can OHK every single tank within the 1.7-3.7 BR range. Whether it be a Sherman, T-34, or Churchill, no UFP (upper front plate) is safe. Ballistics are very similar to all other 75mm long guns in the German line (IV F2, Marder III H, etc. ), and thus experienced German tankers should not have issues assimilating to the Marder's cannon. Belly armour is 15 mm thick. Relatively good HE filler in APCBC rounds. Average hull armour of 50 mm. Capable of penetrating all tanks frontally at its BR range (1.7-3.7). High capacity spotting machine gun in the hull. Tall profile, hindering concealment ability. Very thin gun shield for the gun crew. Open top vehicle, gunner and loader can be easily machine gunned. Vehicle can be hull broken. After the start of Operation Barbarossa, the Wehrmacht found a very dire problem of the lack of a mobile anti-tank system and adequate anti-tank weapons, especially after the appearance of the Soviet T-34 and KV-1 tanks. The only mass-issued anti-tank was the fairly weak 37 mm Pak 36 and the only mobile anti-tank system widely used was the Panzerjäger I with the Czech 47 mm anti-tank gun. Modifications to current vehicles in service was done to put more self-propelled anti-tank weapons into service, which created the Marder I from the French Lorraine, the Marder II from the Panzer IIs, and the Marder III from the Czech Panzer 38(t). The Marder III, with the rest of the Marder series, gave the Germany forces a self-propelled gun mounting a better gun than what was available on German tanks, such as the 75 mm Pak 40 or captured Soviet 76.2 mm guns chambered for the Pak 40 ammo. 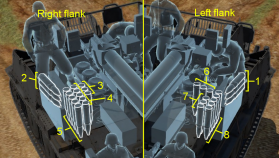 All of the Marders share a lack of armour for the crew, the top and rear of the vehicle is left exposed to mortar, shrapnel, or infantry weapons. This weakness is mitigated with the fact that the Marders are suppose to be anti-tank motor carriages that are to ambush incoming enemy tanks. The Marder III use the Panzer 38(t) as it was a design going obsolete, and lots of Soviet 76.2 mm guns were captured, so they mounted these guns onto the Panzer 38(t) first. The finished self-propelled mount had a higher silhouette than the Panzer 38(t), which left it more vulnerable, but had a rechambered 76.2 mm Pak 36(r) gun with the Pak 40 ammo and could hold 30 rounds in the vehicle. A machine gun on the hull was retained for anti-infantry purposes. The Marder III with a 75 mm Pak 40 gun mounted instead of the rechambered 76.2 gun was called the Marder III Ausf. H. Another variant created, the Ausf. M, featured a lower silhouette and a better sloped armour and fighting compartment, despite only holding 27 rounds for the mounted Pak 40. A total of 3,472 Marder IIIs and its version was created or converted from Panzer 38(t) during its production life. The Marder III fought on all front of the war, being produced from 1942 to 1945, with 2,080 Marder III with the 76.2 mm gun converted and produced. Using the tested design of the Panzer 38(t), the Marder III experienced a reliable mechanical history, and has a gun that could take out most allied tanks in the war. The vulnerability to the crew due to lack of armour was its most pressing issue, with only a front shield plate at most 15 mm thick and side plates that can't enclose the crew. This makes it as very poor assault vehicles or tank substitutes as the open top could allow infantry to easily kill the crew from hidden areas, despite that, it is sometimes repurposed to this role to the chagrin of the crew. As its production was underway, Germany already had a few self-propelled assault weapons being produced such as the StuG III that could have the same anti-tank capabilities, yet was fully-armoured, enclosing the crew in adequate armour. This obvious advantage over the open Marder series encouraged the development of a new kind of tank destroyer from the Panzer 38(t) with better armour, which will eventually create the Jagdpanzer 38(t). Despite that, the Marders continued to serve to the end of the war. Skins and camouflages for the Marder III from live.warthunder.com. Watchout for the "Marder III H" entries as they will not fit on this first version. You need the ones with the small, not rounded turret.